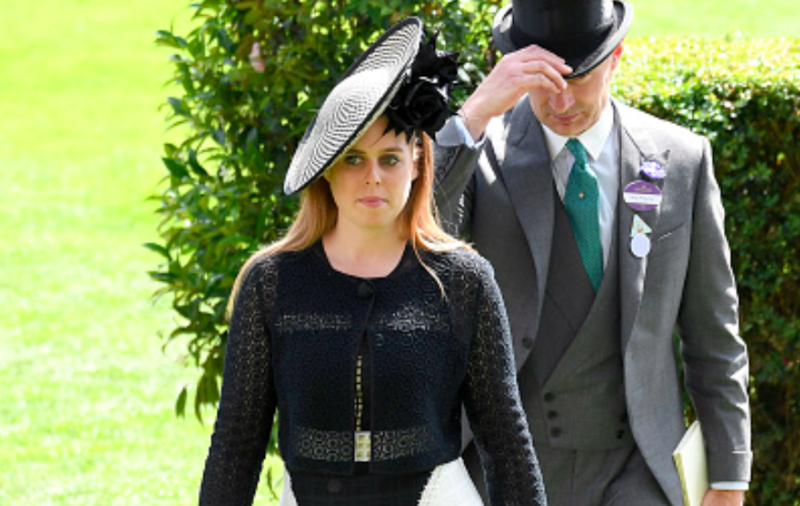 Princess Beatrice attended Royal Ascot day three, also known as Ladies Day, with her sister Princess Eugenie. She opted for a monochromatic dress and black crochet jacket from New York designer, Jonathan Simkhai. Princess Beatrice wore a Jonathan Simkhai dress from the Resort 2016 Collection. A sleeveless midi dress with two contrasting horizontal white square laser cut panels across the bust and waistline, interjected with a vertical black square laser cut panel. The dress features a fitted bodice and waistline. The a-line flared skirt falls to below the knee with a tapered black panel with contrasting white panels that are bordered with laser cut panels separating the black and white fabric. A different style of dress from Beatrice today and another striking look. We love seeing her style evolve so rapidly this year. Beatrice wore a Moschino Cheap and Chic Crochet Cropped Jacket. The black jacket is made from an open circular crochet pattern throughout. A rounded scoped neckline, with long sleeves, cropped at the waist and a snap closure fabric coated button at the neckline. This is the perfect way to add slight modesty and keep warm on a cooler summer’s day. Purchase a nice replicate here. Princess Eugenie has worn this in the past, and we know that the sisters often swap items of their wardrobe. Beatrice wore a Sally Ann Provan ‘Greta’ Saucer Hat, retailing for £400. This is a handmade straw, cream and black herringbone pattern titled disc fascinator with black contrasting trim. The striking feature of this hat is the two large satin black roses, framed with pointed protruding feather details that sit underneath the hat and to the side of the head, creating a dramatic feminine elegance. We love this type of disc fascinator on Beatrice. The Princess’ past two Sally Ann Provan hats have framed her face beautifully, a wonderful choice of milliner for Beatrice. Purchase this hat here. Princess Beatrice wore Nicholas Kirkwood black white suede and snakeskin pointed toe pumps. These elegant pumps showcase a white toe cap with black pinstripe detail and a black contrasting band. A very high tapered spiked and curved back stiletto heel, create a towering height. We know many women would fear wearing such a heel across the grassy fields at Royal Ascot – some may say a brave choice from Beatrice, but she is a seasoned heel wearer. These heels are unfortunately sold out, and have been in the York sisters’ wardrobes for some time; they have both been spotted wearing them, like the cardigan above. Princess Beatrice carried her favourite Pop & Suki ‘Box’ bag, retailing for £154. This bag can be personalised with bold white script font. Princess Beatrice’s bag feature’s the words “be Cool, be Nice’ on the side. This miniature briefcase/luggage style bag has almost become Beatrice’s exclusive go to bag over the past month, with the Princess carrying it to almost every occasion. Purchase this bag here. Get a replicate here.